Download the Headline History here. Alternatively, here is a very brief Summary. Headingley Village may be very ancient, as it stands on a natural cross-roads. But the Anglo-Saxons gave the settlement its name, meaning ‘Headda’s people’s place’. Under the Vikings, Headingley’s Shire Oak became the focus of local government. But following the Norman Conquest, the village was devastated by the Harrying of the North, and it was handed to one of William’s barons. His descendant gave Headingley and its surrounding area to Kirkstall Abbey, which managed the lands until the Dissolution of the Monasteries in 1539. The estates were sold to private owners, much coming into the hands of the Brudenell family, Earls of Cardigan. Headingley gained a rebuilt Hall, a church and a school. Headingley Suburb developed as the village was drawn into the orbit of Leeds. Demand for settlement arose from merchants escaping from the industrialising town, building plots were supplied by Headingley landowners, and the two were connected, first by a turnpike road, and then by horse-drawn public transport. The suburb’s foundation was laid in the first half of Victoria’s reign. Alongside the villas and mansions of the wealthy, stone terraces were built for working people. Headingley steadily expanded, on Headingley Hill and in Far Headingley. In the latter nineteenth century, more large villas were built, extending into Weetwood, now accompanied by row upon row of brick terraces, around Headingley itself, and in Hyde Park and South Headingley. New churches were built, and trams arrived, powered successively by horses, by steam and by electricity. Leeds’ Number One Suburb emerged in the twentieth century. The route of the pioneering bus service was formally recognised as the Number 1 Service. The suburb now had “the most important group of large and small villas and mansions in the city” (Pevsner). 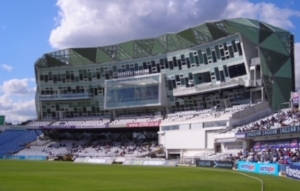 And Headingley Stadium was built, eventually bringing international renown. In the Edwardian era, West Park developed, and new shopping parades were built there and at Hyde Park, and cinemas arrived - the Hyde Park Picture House, the Lounge and the Cottage Road. In the years between the wars, the remaining spaces were in-filled by estates of classic semi-detached houses. In the modern period, most development has had to be re-development, especially new housing estates on former education sites. The Arndale Centre has dominated the town centre. And old buildings have been re-purposed, like the old school on Bennett Road, now Headingley Enterprise & Arts Centre, appropriately HEART. Further Information on individual parts of Headingley and its neighbourhood may be found on the Headingley & Hyde Park and the Far Headingley, Weetwood & West Park pages. These accounts are taken from the two Neighbourhood Design Statements for Far Headingley, Weetwood & West Park (2005, revised 2014) and for Headingley & Hyde Park (2010); copies of both are available at HEART. See also Blue Plaques. For historic photographs, go to Historic Headingley & Our Neighbours. The two essential histories of the area are Eveleigh Bradford’s Headingley: A Pleasant Rural Village (2008) (also available at HEART) and David Hall’s Far Headingley, Weetwood and West Park (2000) (thanks to both authors for their advice).